As promised new themes should be released more regularly and the intervals between new themes should be shortened. 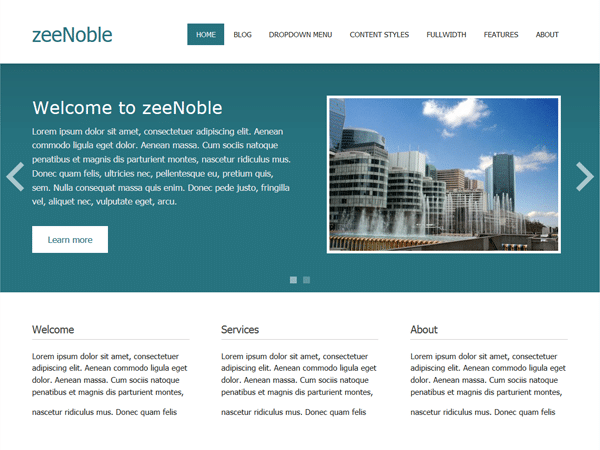 Therefore I’m proud to announce zeeNoble – the second responsive WordPress theme from ThemeZee only three weeks after the first one. zeeNoble is designed for business websites (you can use it for normal blogs, too) and comes with an awesome elegant and fully responsive webdesign. The uniqueness of zeeNoble is the powerful frontpage template which supports a big content slideshow to attract visitors. Of course zeeNoble is free to download as all of my themes. In case you need extra features take a look at the PRO version. It comes with all the neat features of the free version and enhancend customization options like custom colors, custom fonts, unlimited slides, additional widgets and much more. You can get all information about the free theme and the PRO version on the zeeNoble theme page. The next theme will be something completeley different: an one-column theme created for bloggers supporting post formats. Stay tuned!